I’m in Australia this February to preach the Gospel on a tour of six cities across the continent. My father preached there 60 years ago, God did a mighty work and many lives were changed. But Australia today is a nation in need of spiritual revival. Secularism has put down roots, and almost one in three people claim to have no religion at all. The Bible says, God was moved by prayer for the land” (2 Samuel 21:14, NASB)—pray that God will touch that land and open many hearts to the life-changing power of the Gospel. As I write, we are hearing results from our most recent My Hope evangelistic campaign, this one in Italy. We started the My Hope outreach in 2002 in four nations of Central America and went on through the years to South America, Africa and Asia, including nations such as Russia and India, and then Canada, the U.S. and the U.K. As God worked, we have seen millions of people accept Jesus Christ in repentance and faith. In Italy, thousands have already turned to the Saviour, and God is stirring Bible-believing Christians there to share the Gospel with unsaved friends, neighbours and loved ones. Close to 70 percent of the Protestant churches in the country are taking part, and many will continue their My Hope outreach through Easter—over 6,000 evangelistic events are planned across the nation. Please pray for a great harvest of souls rescued for eternity. We are moving into one of the most aggressive three-year plans for evangelistic events in our ministry’s 70 year history, including the continent-wide Australia tour and a Decision America tour of Northeast cities this year, a tour of multiple cities across the United Kingdom in 2020 and east-west tour of cities on both sides of America’s border with Mexico in 2021. There is urgency to take the life-changing message of the Gospel to as many people as possible, using every means we can, while doors of opportunity remain open to us. The Bible warns that “the night is coming when no one can work” (John 9:4, NKJV). My sister Anne Graham Lotz is battling cancer and has had to cancel her speaking and ministry plans for 2019. The treatments are hard on her, but she has good doctors and the will to fight, and her heart is firmly anchored in the Lord. Will you pray for her? We are deeply grateful for your prayers and gifts—we could not carry out this work without you. Thank you for all you do in serving Christ and His Kingdom. But beneath the surface, David was troubled. The Holy Spirit was using Flying Blind to work on his heart. “I was shocked and confronted,” he said. The film shared real-life stories about the need to conquer sin and testified to the power of repentance and the wonder of God’s restoration—something David desperately needed. Early in his career, David fell into a pattern of sexual sin. He swore to himself that he would stop, but he couldn’t, and when his wife eventually found out, she left him. A month after watching the film, David finally broke down and repented of his sin. He has built important accountability and prayer support into his life, and he is now restored and at peace with God. “Turning to Jesus and putting my adult sins at the foot of the cross has been liberating and brought real freedom,” he said. Your church can offer this same forgiveness and freedom to your community by showing Flying Blind. 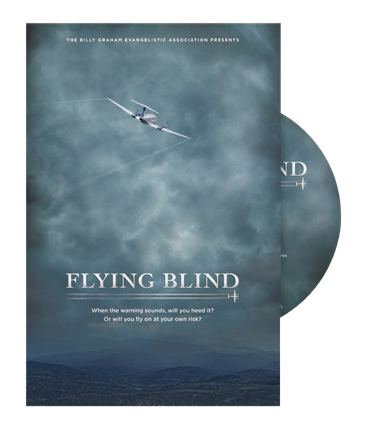 For more information or to watch the trailer today, visit flyingblind.org.uk.